MovingGiants.org | South Africa's Elephant Population Is On The Rise. This Is One Of The Reasons Why. South Africa's Elephant Population Is On The Rise. This Is One Of The Reasons Why. Do good fences make good neighbors? They might if your neighbor is a lion or a cheetah. The impetus for the Moving Giants project came as a response to one very unique problem: Venetia Limpopo Nature Reserve (VLNR) had too many elephants. It’s not the type of issue you hear of very frequently in relation to elephants. How could there possibly be too many when they’re being poached at a rate of 100 a day across the African continent? The answer is nuanced and multi-faceted but one undeniable factor is also, perhaps, the most obvious: fencing. It’s a conservation strategy that is not exclusive to South Africa but South Africa has adopted the model at scale. Nearly every game reserve, from the gargantuan Kruger National Park to smaller, privately-owned game reserves like the VLNR, are fenced. The fencing aims to solve for a wide array of the issues that make human and wildlife cohabitation so difficult, but it also creates its own set of problems, leaving the conservation community divided over South Africa’s use of fencing. Moving Giants spoke with a number of conservation experts, including storied game guide Nolan Armstrong, who walked us through the benefits of fencing, as well as the limitations. There are very real risks in allowing humans to comingle too closely with wildlife. When you’re dealing with large predators, human lives can be at risk. When you’re dealing with elephants trampling and raiding a farmer’s crops, human livelihoods can be at risk. Predators can be a danger to livestock as well as humans, Nolan tells us, children especially. Of course, the danger isn’t a one-way street. The animals have just as much to fear from their interactions with humans. Poachers and subsistence hunters aren’t the only concern. People will go to lethal extremes when their lives and livelihoods are on the line. Animals have been shot on site or poisoned to death. Aside from killings of the intentional and cold-blooded variety, animals often have run-ins with human infrastructure, such as trains or freeways. It’s not uncommon to see visual reminders of how animals and infrastructure don’t mix. 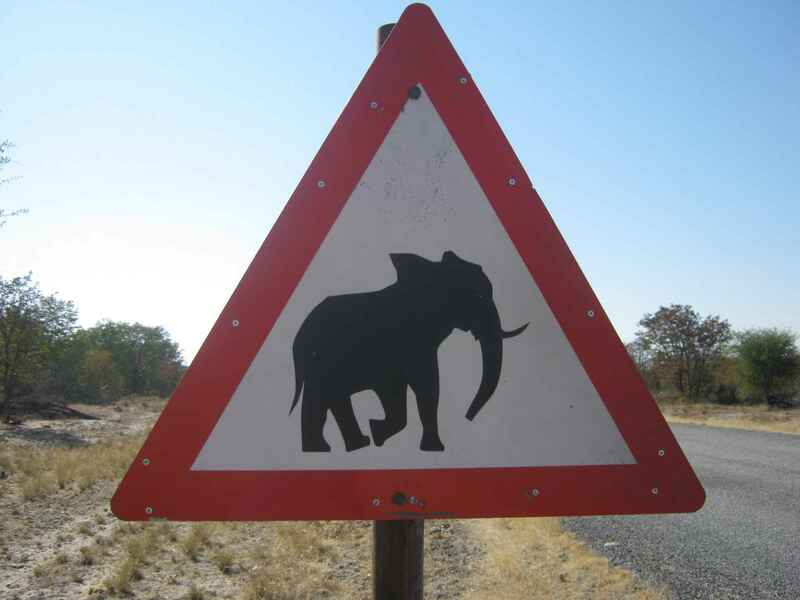 An elephant crossing sign from Botswana. Credit: Creative Commons. Fences provide what is known in the conservation community as “hard edges” between human and wildlife territory. Clearly demarcated, there is little room for incidental run-ins. Armstrong, who lives in a more remote area of KwaZulu-Natal, South Africa, highlighted the community benefits of being able to transform a smaller fragment of land into a reserve. “Historically the area I live in has been utilized for cattle farming. The only tourism in the area was for Battlefields tours. The introduction of the game reserve in the area has brought a huge increase in ecotourism and tourism in general. This, in turn, has provided employment for hundreds of local community members.” Obviously without the “hard edges” that fences provide, small communities would not be able to accomodate Big Five wildlife in a way that was safe for humans or animals. The ability to utilize small habitat fragments also ensures more space for wildlife. If animals could only safely exist in parks the size of Kruger or Limpopo (just across the border from Kruger in Mozambique), they would be limited to those spaces exclusively. The ability to create smaller, maintained ecosystems means the private and public sectors can make use of different plots of land across the country — providing more space for wildlife overall. If fences can keep elephants in, can they keep poachers out? The short answer: kind of. If fences can keep elephants in, can they keep poachers out? The short answer: kind of. Fencing definitely reduces the risks of poaching significantly, but it doesn’t eliminate them. Having the clear demarcation of fencing makes it impossible for poachers to claim they ended up somewhere that they shouldn’t be by accident, but in the words of Bernard van Lente, Peace Parks Foundation’s program manager at Zinave National Park in Mozambique, “When you have nothing to eat, you have nothing to lose.” That said, while elephant numbers are falling nearly everywhere else in the world, South Africa has a surplus of elephants. Fences certainly play a part in allowing that to be a reality. The spread of disease from livestock to wild animals has been a very real problem in South Africa, with frequent outbreaks of foot and mouth disease impacting wild buffalo in particular. Other diseases, such as bovine tuberculosis, can infect many mammalian species and severely impact the health and longevity of entire populations. Fencing can limit the interactions between livestock and wildlife thus limiting spread of diseases. Fences can also isolate impacted communities so that they don’t further spread disease to previously uninfected animals across the country or the continent. “Fences do also bring with them some limitations, particularly with regards to animal movements,” says Armstrong. “In drier times, animals would traditionally move from areas that offer little or no food and water to areas offering more nutrition. Obviously, with fences in place, these animals’ movements are limited, especially on smaller reserves. This can result in overgrazing, which can lead to erosion, which can make the land less viable for growth — it’s a vicious cycle.” There are further implications we don’t yet understand. Changing migration patterns can have unforeseen consequences. Wildlife fencing can represent “both a functional and symbolic barrier to local communities and became perceived by them as representing a negative, exclusive, imposition designed by wildlife authorities to protect wildlife with little consideration for human welfare,” according to a paper published by the African Wildlife Conservation Fund. “Many poorer communities rely on hunting for food,” adds Armstrong. In that way, putting up fences can seem like solving for conservation without solving for the very real issues of poverty that often symptomatically threaten conservation. Developing relationships with the community is an absolute imperative. “Communities have to understand why the elephants are more beneficial to them alive than dead,” van Lente told Moving Giants. In the case of an organization like Peace Parks, that means working holistically with the communities inside and around the park to ensure that everybody has a vested interest in conservation. Genetic diversity is an integral part of conservation. Inbreeding and reductive gene pools can wreak havoc on any species — and the animals that live in the African bush are no exception. A study of genetic diversity amongst lions kept in metapopulations found that, when genetic diversity was not accounted for in reserve management, genetic pools became redundant, resulting in both health and longevity decreases for the lions. When you build a fence, you project a new ecosystem onto the landscape — because humans have intervened to create it, humans have to continue to intervene to maintain it. When you build a fence, you project a new ecosystem onto the landscape — because humans have intervened to create it, humans have to continue to intervene to maintain it. Most of the above outlined risks can be mitigated or eliminated with competent reserve management, says Armstrong. “I believe that if the area is of a suitable size, and regular assessments on the food availability, food type, animal diversity and impact those animals have on the environment is done, then having fences does not adversely affect the animals,” Armstrong tells Moving Giants. In other words, the pros can outweigh the cons if reserve management is done responsibly. The problem of having too many elephants only exists because of proper reserve management — likewise, the need for a viable home for surplus elephants only exists because of proper reserve management. To learn more about how Venetia Limpopo Nature Reserve is rehoming 200 elephants, check out our episodic video series: “Moving Giants,” premiering today.